The Balducci Palace, well noted for its historic value as a prime example of a seventeenth century building, is of National importance. 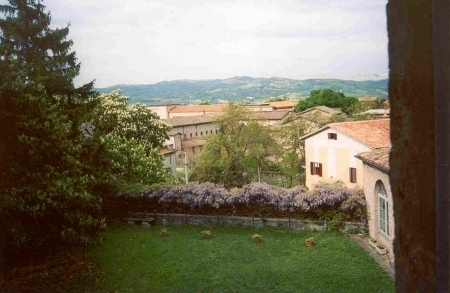 In a wing of the palace one independent flat was constructed with the view on internal garden. The apartment is completly furnished and it is divided in the following zones: diningroom with kitchen corner ( refrigerator, stove, washing machine ), livingroom with working fireplace and 2 single sofa bed , bedroom wiith 1 double-bed and a normal TV, bathroom with shower and a small hall. The architecture of Gubbio represents, perhaps, the masterpiece of the medieval period and of the 13th-14th centuries: intact towers, facades of houses blackened from the centuries, gothic churches and palaces that symbolise the power of this medieval city-state. 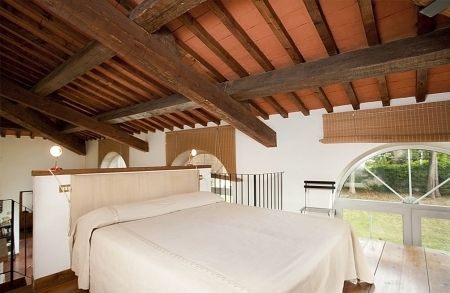 -At booking time the client will provide as confirmation a down payment of 25% of total rental amount. In case of cancellation 30 days or more before arrival this amount will be refunded.
. the remaining 75% of total rental amount. You can send the deposit as bank transfer to my bank account or via the PayPal e-bay system (www.paypal.com). 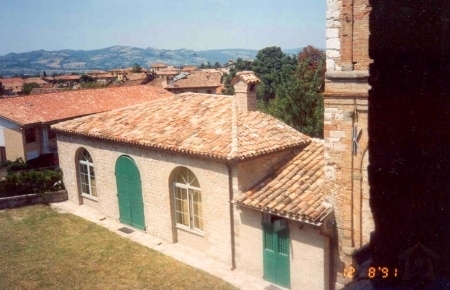 Gubbio is waiting for you with its medieval palaces, its churches which date from the pre-Roman era to the end of the fiftheenth century, with its museums and its shops and stands, selling local crafts and foods.. 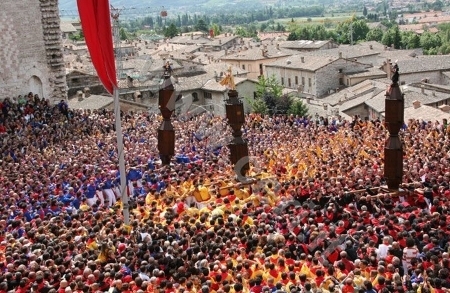 Exciting folklore, artistic and cultural events take place from May to November: local festivals (the Festa dei Ceri, 15 May, the National Crossbow competition, the last Sunday of May and the Regional Crossbow competition, 14 August); the music and theatre seasons ( in July and August ); the Truffle fair (starting the 1st of November) and the Antiques Market (held on the third week of every month). Due to its geographical position, from Gubbio you can easily reach other towns of relevant artistic and historical reputation: Perugia and Assisi (40 Km), Spoleto, Todi and Urbino (100 Km). How to reach Gubbio: BY CAR - From North: A14 Autostrada Adriatica, exit Fano, Superstrada Flaminia direction Roma, deviation Gubbio - From South: A1 Autostrada del Sole, exit Orte, Superstrada E7, deviation Perugia direction Cesena, exit Gubbio-Bosco BY TRAIN - Railway line Ancona-Rome , Fossato di Vico Station - Gubbio (19 km. away from Fossato, bus services to Gubbio). - Railway line Firenze -Terontola - Foligno, Perugia Station - Gubbio (40 km. away from Perugia). BY PLANE - Regional Airport in Perugia, loc. S. Egidio, 12 km. away from Perugia. Information bureau: tel. +39075 592141 - Airport "R. Sanzio" in Falconara (An) 155 km. away from Perugia. Information bureau: tel. +39071 28271 - International Airport "Leonardo Da Vinci", Fiumicino, Rome 120 km. away from Perugia. 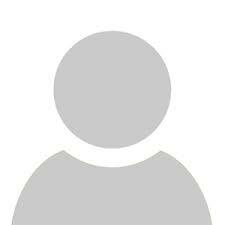 Information bureau: tel. +390665951. 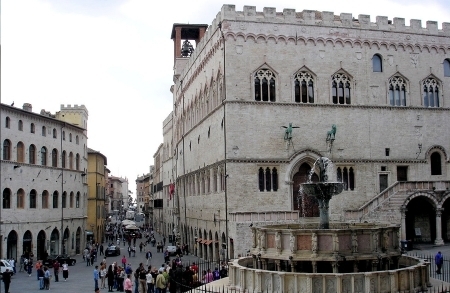 Daily bus services to Perugia. 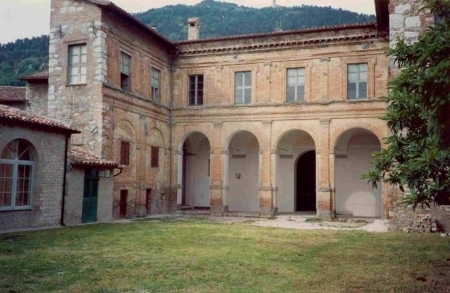 Information bureau: +390755009641 How to reach �Palazzo Balducci� - Via Reposati 8 Palazzo Balducci is located in the Centre of Gubbio wihitin the Middle Ages wall. For this reason, coming from Nord as from South, you have to reach the ring-road and then you should follow the indication Gubbio-Centro - Via Perugina. At the end of Via Perugina you will see a cross light. Take the second on the right: Via Mazzatinti. After 100 meter the street turns on the right and there it starts Via Reposati. The number 8 is the second big old door on the right. You can park the car for the time you carry the luggages in the flat (down stairs in front of the internal garden). If the door is closed you can ring �Brignone-Brofferio�. After you have carried your luggages you should park your car at the end of Via Reposati turning on the left and after on the right, outside the Middle Ages wall behind the Chiesa of S.Pietro. It gives you the opportunity to understand the culture and the traditions of the place you visit. The independent apartment, which has a kitchen or a kitchen corner, is a good alternative for the accomodations which offer a bedroom, because it is cheaper.